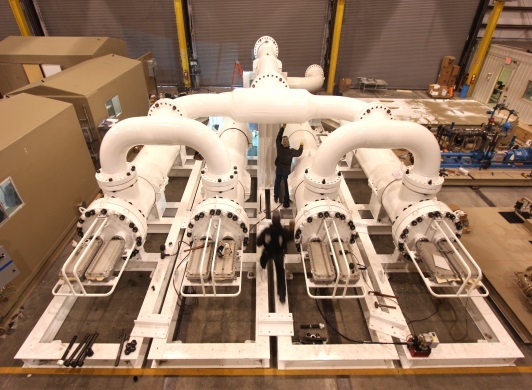 STWA’s AOT Midstream 110-ton Crude Oil Viscosity Reduction System Installation for long distance pipeline flow assurance during manufacturing final test-fit prior to shipping in February 2014. Photo: STWA, Inc.
We’re pleased to inform our shareholders that last week the AOT Midstream recently fabricated to the specifications of our customer was delivered to the pipeline site in Kansas and is undergoing installation on the pump station. A news release pertinent to this development is posted in the IR area of the STWA website here. The shipment of 110-tons of the AOT Midstream system was loaded onto seven flatbed freight trucks in Casper, Wyoming approximately one week ago and arrived safely for pre-installation inspection by engineers. For photos taken of various stages of this process, click here. The realization of this important milestone, readying AOT for commercial deployment, has been possible due to the collaborative efforts between our team and the 19 companies involved in this project. Working with so many dedicated professionals focused on bringing this product to market has truly been a great experience for our company. Thank you to all that have made this a reality, we truly value your support. We look forward to providing you with further updates as the installation and deployment progresses.